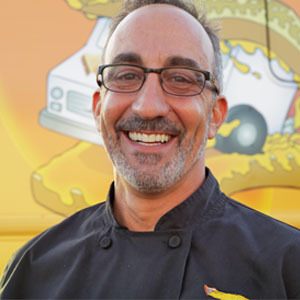 Dave Danhi has single-handedly brought gourmet grilled cheese sandwiches to the masses with the proliferation of his Grilled Cheese Trucks. He was inspired to start the business when he entered the 2009 Grilled Cheese Invitational with his Cheesy Mac and Rib Melt (now a signature truck item) and witnessed grilled cheese fandom first hand. Danhi spent years with King’s Seafood Company, proprietor of several highly regarded restaurants in Southern California. Ultimately, he became Executive Chef of their flagship restaurant, the Michelin-starred Water Grill in Downtown Los Angeles. Before that, he was Executive Chef at Georgia restaurant in Hollywood where he won the Robert Mondavi Award of Culinary Excellence and other numerous best restaurant awards. "A sandwich that is just a little different than the one mom used to make." A delicious twist on the campfire classic, this sandwich provides layers of sweet flavor. There's nothing a comforting as the combination of fried chicken, waffles, and maple syrup.